See the most current Courses and Programs of Study Catalog for the requirements for the Chemistry and Biological Chemistry concentration programs and course listing. 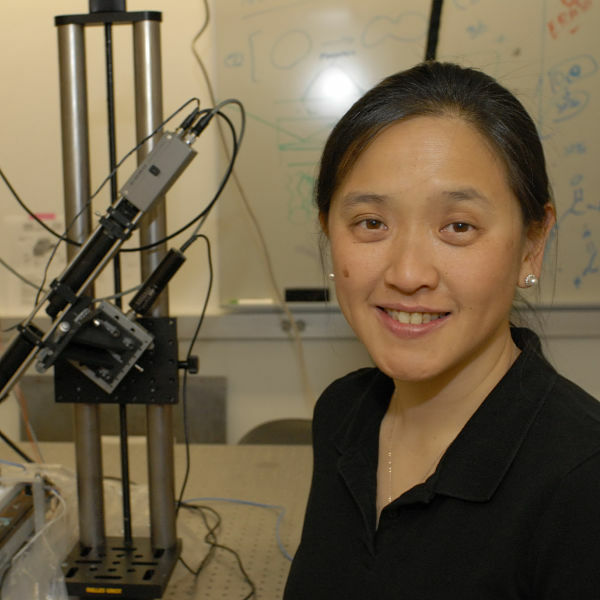 The Faculty Advisor for Chemistry and Biological Chemistry majors is Professor Ka Yee Lee. If you are considering graduate study in chemistry or a related field, by fall or winter quarter of your third year you should seek out an opportunity to do research, even if you do not plan to do an honors thesis. Typically students begin research on a volunteer basis during their second or third year of study. Productive students can be hired as paid assistants here or at another institutions over the summer. RESEARCH OPPORTUNITIES - How do I learn about which faculty member's research might interest me? The best way to start is to talk to friends or classmates who have done undergraduate research with faculty here and to read the descriptions of the research interests of faculty in chemistry and related fields. A student should feel free to explore opportunities in other interdisiplinary areas not listed below (such as molecular or condensed matter physics, computational biology, etc.). If you are planning to pursue an honors thesis in chemistry, the research should be in chemistry or a related chemical area (we have had students who have done honors work in biology and physics, but their research involved problems related to chemistry and was approved in advance by the chemistry undergraduate advisor). RESEARCH OPPORTUNITIES - How do I approach a faculty members about doing research in their groups? After you have identified a few faculty whose research looks interesting to you, contact them directly for more information. If you are considering an honors thesis, ask which research projects might be appropriate. In many groups you will learn the most day to day from the graduate students in the group, so you may wish to meet them. If all parties seem interested and willing, ask the faculty member if he or she can take you on and how you should proceed -- how often and when you are expected in lab, when group meetings are, and so on. If you wish to learn about opportunities in other groups before actually asking a faculty member if you can work with them, let the faculty member know when you plan to contact them again and thank them for taking the time to let you know about possible research opportunities (do not take more than a week or two to look around once you have had serious conversations with one faculty member). It is usual to approach your favorite person first so that if they spend a half-hour telling you about their research and then tell you they have a spot available for you, you can them tell them you are delighted to accept. Do not get discouraged if your favorite group is already over-committed. Use the opportunity to ask for advice on other research groups in the department. Keep in mind that when you first work with a group it is a time to learn to be productive. If it is a good research project, it will take time to learn how to make a contribution. You should not expect to be paid during the academic year, but that work can prepare you for a paid summer internship. RESEARCH OPPORTUNITIES - How do I secure a paid position on campus over the summer? The best way to secure a paid research position over the summer with a faculty member at the U of C is to work with them on a volunteer basis during the academic year preceding the summer you want to work full time on research. Whether you plan to do an honors thesis or not, one option is to identify a couple faculty of whose research interests you by reading the Description of Research of Faculty in Chemistry or Biological Chemistry and then contacting the individual faculty member directly. The most common is for the faculty member to pay you from his or her research grants. The Department of Chemistry and the Department of Physics also often have National Science Foundation REU (Research Opportunities for Undergraduates) programs running each summer that you may apply to for salary support (rather than an individual faculty member having to scrape the funds from his/her research grants). Contact the Chemistry Advisor (chemadvisor@uchicago.edu) about the Chemistry REU site and contact Stuart Gazes (gazes@uchicago.edu) about the Physics REU site. The Biological Sciences Collegiate Division also has a Summer Research Fellowship Program; information about this program is available at http://bscd.bsd.uchicago.edu (deadline for application is usually in April). First years willing to make a commitment to conducting research in the Department of Chemistry may be eligible for the James Norris, Jr. Grant for Undergraduate Summer Research in Chemistry. If you are a second-year student and want to pursue a PhD program, you may quality for the Mellon Mays Fellowship, which funds a summer Research Training Program. See http://mellonmays.uchicago.edu/summer/index.shtml for more information. RESEARCH OPPORTUNITIES - What other summer research opportunities are there outside of the university? Here are a wide variety of summer research programs for undergraduates across the country at universities, companies, and in government laboratories. For further information on the types of programs available, consult the file of undergraduate research opportunities in the undergraduate chemistry advisor office. Information on a few of the programs are posted on the bulletin board (not display case) just outside Kent 107 labeled "Announcements and Information for Chemistry and Biological Chemistry majors ". Some have Web sites; links to a few of them are listed below. One of the largest formal summer research programs at universities are the National Science Foundation REU (Research Opportunities for Undergraduates) sites. (When you get to that page, click on Chemistry in the left hand column for a list of sites. They update them in winter quarter for the following summer.) There are also undergraduate research programs at government labs such as Argonne National Laboratory. (From this page, it is necessary to follow the "Higher Education" link, then to Undergraduate: "Student Research Participation Program (Fall and Spring Semesters) or Lawrence Livermore Laboratory and positions at industrial companies. Applications for some of these have very early due dates (as early as November of the summer before you want to do research). Beyond any advertised program, you may call faculty at a university individually to request a summer research position. Particularly if you are considering graduate school at that university and plan to use the summer research to have an advance look at their graduate program, many faculty will be responsive to such a request. Consult the ACS Directory of Graduate Research (the library has a copy) to find the research areas and telephone numbers (or email addresses) of chemistry faculty at Universities in Ph.D. granting institutions across the country. We will gradually collect Web site links to other summer research programs and list them below. However, the most complete list is in the file in the undergraduate advisors office, so just call for an appointment to come look at it if you are looking for a summer research opportunity outside of The University of Chicago. RESEARCH OPPORTUNITIES - What are the requirements for an Honors Thesis in Chemistry? The final paper should be submitted by typically the first week in May for students graduating in June. Inquire about the specific due date each year with the chemistry advisor (The chemistry advisor has to provide the Master's office with a list of potential honors graduates in early May -- these deadlines are rigid because they have to print the proper diplomas). Typically, the paper should contain at least 15 pages of text (not including figures). The general form should follow the outline of a journal research paper, including proper citations. While most of the paper may be specialized, the introduction should serve as a general outline of the scientific questions addressed and a review of others work toward answering those questions; this part should be readable by people not working in that research area (e.g. Could your classmates with an interest in another area of chemistry understand the importance of the scientific questions addressed by your research from your introduction?). The exact format of the paper should be decided upon by the student in consultation with the research mentor since many faculty like to use the theses as a research record and aid in writing up results for a publication. For example, a synthetic chemist might wish to include photocopies of key NMR or IR spectra even though those would not be typically published in a journal article; a theoretical chemist might include an appendix with program code and annotation; a physical chemist might want to include detailed drawings of a piece of machined apparatus. What the research advisor wants (and needs) will always vary from group to group. The grammar and general appearance of the paper should be of the standards expected for a University of Chicago graduate. PLACEMENT TESTS - What placement tests are offered for entering students and how do I register? A chemistry placement test, taken online in the summer, is required for all students intending to enroll in general or introductory chemistry. In order to be placed into Honors General Chemistry, students must pass the second part of the online exam, the Honors Placement Test. A placement test for math or calculus, taken during O-Week, is also required. Consult the College Orientation Office for information about the administration of the placement tests. If students desire course credit, as well as placement, students must take chemistry accreditation tests. ADVANCED ACCREDITATION TESTS - What chemistry course accreditation tests are offered and how do I register? Accreditation tests for general and organic chemistry are optional and can be taken by students who believe they have sufficient background in these areas to obtain credit for these courses. These tests are open only to first year and transfer students. The accreditation tests are often held in Kent 101, but check the orientation schedule or this page for changes. If you have a scheduling conflict, call Dr. Vera Dragisich at 2-3071 in advance of the test date to request to take the exam at a different time. Advance notice is preferred, but we can take rescheduling requests up until the first day of classes of the fall quarter. Bring a calculator. These exams are challenging, so your background needs to be very complete to pass them. This is the only time during the year that accreditation tests are given.